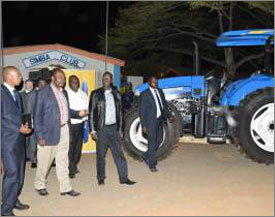 At the launch in Kisumu in western Kenya, Federico Bellotto, business director for Africa and Middle East at New Holland, said that the new line of TS6 Series tractors "are customised to operate in the tough conditions here in Kenya. They offer Kenyan farmers real value for their investment; they can be depended on to work long hours tirelessly in multiple applications, in the field or on the road, in the toughest conditions; they are easy to maintain; and they come at a budget-friendly price." The four TS6 Series tractors run fuel-efficient turbocharged, inter-cooled, Tier 3 compliant engines. The TS6.110 and TS6.120 tractors run on a four-cylinder, 4.5 litre engine, while the TS6.125 and TS6.140 variants come with a six-cylinder, 6.7 litre engine. These engines deliver a performance ranging from 82 kW to 104 kW and maximum torque of up to 625 Nm. For applications that require more hydraulic power than provided by the default dual-pump, open-centre hydraulic system, an auxiliary 34-litre pump can be added to the 49-litre implement pump. A dedicated 34-litre steering pump ensures that the hydraulic demands of the rear implement do not affect the steering. TS6 Series tractors can handle three-point-mounted implements with ease with the standard 2,410 kg lift capacity hitch. For heavier implements, an additional lift ram can increase capacity to 3,639 kg. A second additional lift ram can raise the capacity further to 4,647 kg. The standard 8x8 mechanical shuttle transmission is ideal for operations like roadside mowing and haying, where forward/reverse shuttling is not often needed. The 16x8 DualPower hydraulic shuttle transmission, with an additional underdrive gear for each forward speed, offers the optimal solution for hilly conditions and haying. The TS6.110 and TS6.120 can be used with the optional 2WD heavy-duty axle for heavy loader work, or a Class 3 FWD axle for increased traction and pull. The TS6.125 and TS6.140 come with the heavy-duty axle as standard, and a heavy-duty Class 4 FWD axle is also available. Also, a 98-inch rear bar axle can be attached if row spacing flexibility is needed to prevent damage to the crop and to have the option of using dual rear wheels for better flotation to protect the soil. Servicing TS6 Series tractors is simple and quick. The flip-up, one-piece hood provides easy access to all service points. The 150 litre fuel tank on the four-cylinder models and 235 litres tank on the six-cylinder ones ensure that refuelling is kept to a minimum.